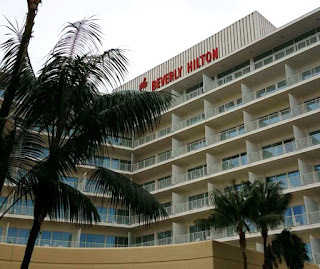 The Oscar nominees gathered Monday at the Beverly Hilton in Beverly Hills, Calif., for the first time since being nominated on Jan. 24. 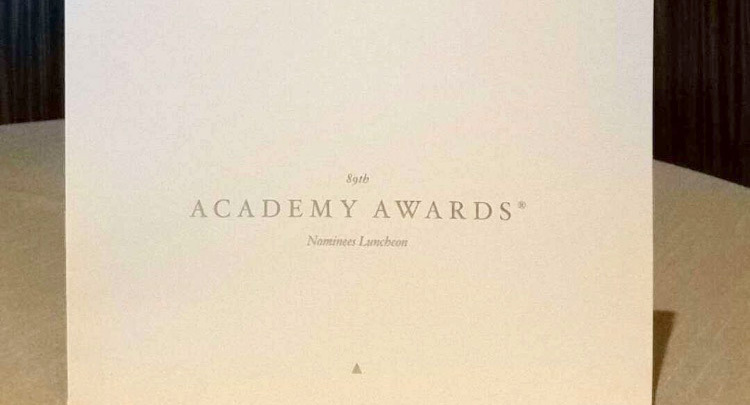 Everyone in attendance at the 2017 Oscars Nominees Luncheon received a name tag. 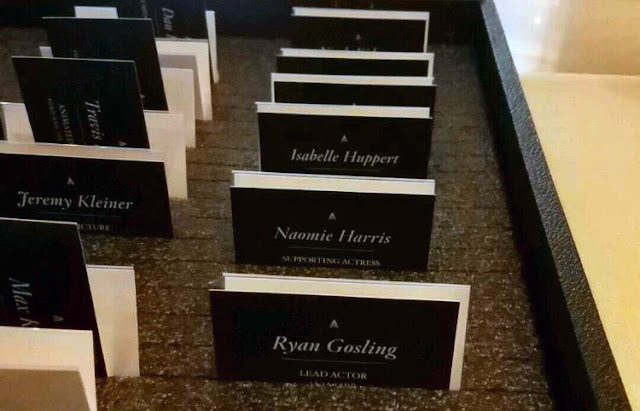 The specially designed black name tags, however, were reserved for the more than 160 Academy Awards nominees being celebrated. Photos courtesy The Academy social media. The Oscar nominees gathered for the first time since being nominated on Jan. 24. 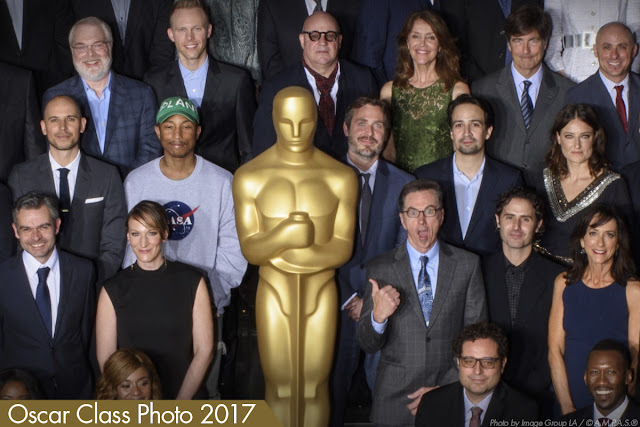 Honored actors and directors, in addition to more than 140 other nominees, hobnobbed amongst each other in a day of celebration less than three weeks before the big ceremony. Nominees and invited guests dined on Chilean Sea Bass with couscous, seasonal vegetables, heirloom carrots and over-roasted tomatoes. Wines on the menu were annual standards: Cakebread Sauvignon Blanc, Hahn Santa Lucia Highlands Pinot Noir and Piper-Heidsieck Champagne Brut. During the opening greeting, Academy President Cheryl Boone Isaacs spoke of art and diversity. "Art has no borders. Art has no language," she said. "Art doesn’t belong to a single faith." The luncheon encourages conversations and networking. Nominees are spread out at all of the tables and are seated with reporters, current Academy governors and past Academy presidents. All of the Acting nominees were expected to attend, except Andrew Garfield and Michael Shannon. 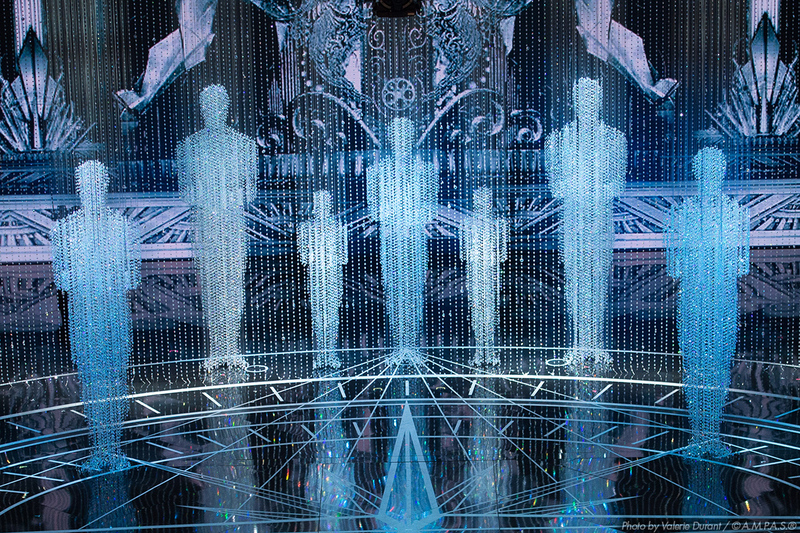 All five nominees in the Directing category – Damien Chazelle, Mel Gibson, Barry Jenkins, Kenneth Lonergan and Denis Villeneuve – were expected to attend. The luncheon is known for its "Class Photo," where all of the nominees get on bleachers and have their photo taken. Seated (left to right): Joanna Natasegara, Burt Dalton, Dave Parker, Joi McMillon, Emma Stone, Matt Damon, Natalie Portman, Octavia Spencer, Kimberly Steward, Theodore Ushev, Mahershala Ali, Andrew Coats, Dustin O’Halloran, Justin Timberlake, Ruth Negga, Rafaela Niehausen, Joe Walker, Georgio Gregorini. First Row: Lou Hamou-Lhadj, Sélim Azzazi, Gary Summers, Juanjo Giménez, Luke Davies, Anna Pinnock, Chris Scarabosio, Giacun Cadull, Timo von Gunten, Vincent Cirelli, Arrianne Sutner, Oliver Jones, Lauren Beck, Kevin O’Connell, Alan Barillaro, Mary Zophres, Sylvain Bellemare, Max Martin, Kahane Cooperman, Stephen Elliis, Osnat Shurer, Jordan Horowitz, Carla Hacken, Nancy Haigh. Second Row: Jake Roberts, Max Karli, Kim Magnusson, Dan Levine, Marc Platt, Richard Bluff, Dan Lemmon, Julie Yorn, Christopher Nelson, Andy Wright, Robert Mackenzie, Craig Hammock, Fred Berger, Pharrell Williams, Patrick Osborne, Lin-Manuel Miranda, Adele Romanski, James Laxton, Bernard Gariépy Strobl, Michael Dudok de Wit, Taylor Sheridan, Kevin J. Walsh, Steve A. Morrow, Aaron Ryder, Alan Robert Murray, Daphne Matziaraki, Karl Johan Schuster, Hannes Holm. Third Row: Julie Goldman, Bub Asman, Casey Affleck, Michelle Williams, Aske Bang, Brad Schiff, David Linde, Damien Gazelle, Lucas Hedges, Stephane Ceretti, Adam Valdez, Caroline Waterlow, Nicholas Britell, Jeff Bridges, Ron Clements, Justin Paul, Gianfranco Rosi, Renée Tondelli, Thomas Newman, Marc Sondheimer, Ai-Ling Lee, Stuart Wilson, Brian McLean, Byron Howard, Angie Fielder, Clark Spencer, Barry Jenkins, Mildred Intro Morgan, Hal Hickel, Andrew R. Jones, Wylie Stateman, Gene Serdena. Fourth Row: Joel Harlow, Paul Hotte, Todd Black, Raoul Peck, Marcel Mettelsiefen, Jenna Topping, Viggo Mortensen, Chris Moore, Steve Emerson, Andy Nelson, Denzel Washington, Jess Gonchor, Alessandro Bertolazzi, Orlando von Einsiedel, Cara Speller, Robert Legato, Travis Knight, Eva von Bahr, David Permut, Love Larson, Guy Hendrix Dyas, Nicole Kidman, Dev Patel, Mel Gibson, Ezra Edelman, Mike Mills, Naomie Harris, Donna Gigliotti, Jeremy Kleiner, Neil Corbould, Claude Barras, Viola Davis, Greg P. Russell, John Gilbert, Richard Alonzo. Fifth Row: Martin Zandvliet, Linus Sandgren, Nat Sanders, Iain Canning, Greig Fraser, Kenneth Lonergan, Rich Moore, Justin Hurwitz, Isabelle Huppert, Tom Cross, Spencer Averick, Maren Ade, Denis Villeneuve, John Knoll, Roger Ross Williams, Jeffrey J. Haboush, Tarell Alvin McCraney, Shawn Levy, Dan Krauss, Ryan Gosling, Benj Pasek, John Musker, Bill Mechanic, Eric Heisserer, Kristof Deak, Patrice Vermette, Allison Schroeder, J. Ralph, Theodore Melfi, Howard Barish.